Virginia Professional Wildlife Removal Services, LLC. is Licensed and Insured, and provides both residential and commercial Richmond VA Squirrel Removal services. We offer squirrel removal, trapping, management, capture and control services in Richmond, Henrico, Chesterfield, Glen Allen, Short Pump, Chester, Mechanicsville, Ashland, Midlothian, Bon Air, Woodlake, Albemarle, Brandermill, VA, Virginia, West End and surrounding areas. From gray squirrels to flying squirrels, Virginia Professional Wildlife Removal Services will remove squirrels of all types and prevent them from entering your home and business. We are Richmond’s Animal control and wildlife removal specialists. Virginia Professional Wildlife Removal Services provides residential and commercial nuisance squirrel trapping, squirrel removal, squirrel control, squirrel damage repairs and squirrel exclusion for Richmond, Virginia and surrounding areas. Do You Need Squirrel Removal Services In Richmond, VA? The Gray Squirrel (Sciurus carolinensis) often causes problems in Richmond, Virginia when it decides to take up residence inside of your attic. Once in your Richmond attic they can be extremely destructive – tearing up and soiling insulation, gnawing on wires and structural materials, and generally making a lot of disruptive noises. 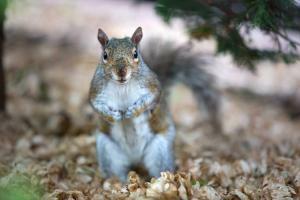 Virginia Professional Wildlife Removal Services performs many squirrel evictions every year in Richmond, Virginia. We are not only knowledgeable in eviction techniques, but also in exclusion techniques to prevent your problem from recurring in your Richmond home or business. Richmond Squirrels are diurnal, meaning they are active twice a day, generally in the morning and evening. They mate two to three times a year and have litters of 3-5 young per litter. 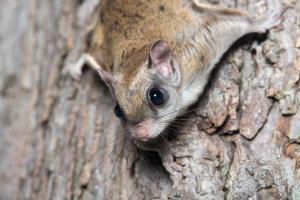 The Southern Flying Squirrel (Glaucomys volans) can also be a problem in the attics of Richmond, VA homeowners for many of the same reasons as the Gray Squirrel. Squirrels in Richmond may occasionally damage forest trees by chewing bark from branches and trunks. Pine squirrels damage Ponderosa pine, jack pine, and paper birch. In the Southeast, fox squirrels damage loblolly and other pines. Squirrels in Richmond may eat cones and nip twigs to the extent that they interfere with natural reseeding of important forest trees. This is a particular problem in Ponderosa pine forests where pine squirrels may remove 60% to 80% of the cones in poor to fair seed years. In forest seed orchards, such squirrel damage interferes with commercial seed production. In nut orchards, squirrels can severely curtail production by eating nuts prematurely and by carrying off mature nuts. In New England fruit orchards, pine squirrels may eat ovaries of cherry blossoms and destroy ripe pears. Pine, gray, and fox squirrels may chew bark of various orchard trees. In Richmond, VA residential areas, squirrels sometimes travel powerlines and short out transformers. They gnaw on wires, enter buildings, and build nests in attics. Richmond Squirrels may damage siding, insulation, or household contents when they take up residence in homes or other buildings.They frequently chew holes through pipelines used in maple syrup production. Squirrels in Richmond occasionally damage lawns by burying or searching for and digging up nuts. They will chew bark and clip twigs on ornamental trees or shrubbery planted in yards. Often squirrels take food at feeders intended for birds. Sometimes they chew to enlarge openings of bird houses and then enter to eat nestling songbirds. Richmond Flying squirrels are small enough to enter most bird houses and are especially likely to eat nesting birds. A very small squirrel. Very silky coat grayish brown above, white below, with hairs all white from tip to base. Loose fold of skin between foreleg and hind leg. Flattened, gray-brown tail. Large black eyes. L 7 3/4-10 1/8″ (198-255 mm); T 3 1/8-4 3/4″ (81-120 mm); HF 7/8-1 1/4″ (22-32 mm); Wt 1 1/2-3 1/8 oz (45-90 g). Slightly larger Northern Flying Squirrel is a richer brown, with abdominal fur usually gray at base. Breeding: Mates in early spring; 2-7 young born after gestation of 41 days. Often second litter August-September, usually by females not breeding in spring. Habitat: Various deciduous forests such as beech-maple, oak-hickory, and, in the South, live oak. Range: Eastern U.S. (except for north New England and southern tip of Florida) east of Minnesota, east Kansas, and east Texas. Richmond Flying squirrels may cause damage when they enter buildings via construction gaps, dormer and louver vents, chimneys, fascia boards and soffits. Their entrance hole is often times the size of a quarter. Squirrels in Richmond, VA have been responsible for starting fires by chewing on electrical wires. Other damages include accumulated droppings, urine stains, chewing and gnawing on wood, and degradation of insulation. Outside their Richmond home they are known to denude bark on trees and shrubs, dig holes in turf, and raid bird feeders and gardens. There are few health concerns associated with flying squirrels. They are, on rare occasions, carriers of rabies and typhus, but these squirrels pose little, if any, significant threat to humans. There are various approaches for controlling flying squirrels in Richmond, Virginia. Prevention of the flying squirrel entry, or excluding the site, is of extreme importance in solving this situation. Another technique is humanely live-trapping the flying squirrels from the space. Cage trapping flying squirrels can be utilized, using nuts and vegetables. Tree trimming around the building will discourage use by these squirrels, along with other birds and animals. We also recommended installing chimney caps on any uncovered chimney, to prevent unwanted flying squirrel entry in Richmond. To successfully manage a Richmond flying squirrel population, you must have an integrated wildlife pest management plan. Virginia Professional Wildlife Removal Services uses multiple approaches to eradicate and exclude these and other nuisance animals from your Richmond home and property. Need Richmond VA Squirrel Removal Control?